Making your own backpacking food is a great alternative to buying pre-packaged backpacking meals. Spending time in advance of your backpacking trip making the food can save you money, provide you with better tasting food, and prove to be more nutritious than store bought food. When deciding what types of food to bring on a backpacking trip, most hikers want food with the most nutrition and carbohydrates in the lightest weight, smallest bulk, possible. All of the food for the trip needs to fit into your pack as well as supplies to cook it, clothing, sleeping equipment, and other essentials. The food you make needs to be compact, tasteful and nutritious. Dehydrating fruits, vegetables, and meat before you leave on your trip is one of the best methods of making your own backpacking food. The dehydrated food is compact and lightweight to carry in your backpack. Once you arrive at your destination you can eat the food dry and crunchy or rehydrate it with water. Dehydrated food requires no refrigeration while it is dry. 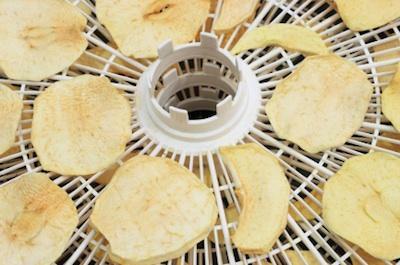 Most dehydrators come with instructions on how to dehydrate fruits, vegetables, and meat. It is important to follow these directions. In most cases, it is probably best to dehydrate fruits and vegetables separate from your meat. Place strips of meat in the marinade-cover and refrigerate for two hours or overnight. Boil the meat for about five minutes before drying to reduce possible food borne microorganisms. The best way to store and carry dehydrated food is in heavy-duty zipper lock bags. Store each fruit and vegetable individually. Put the food into the bag and seal it, leaving a one-inch opening, squeeze out as much air as you can and seal it the rest of the way. Label the bag with a permanent marker so you will know what it contains. Assembling your dried ingredients with other foods will help in making your own backpacking food. When you want to hydrate the meal boil two cups of water, pour the bag of ingredients into your pot and boil until soft. Boil in two cups hot water until soft. The National Center for Home Food Preservation is an excellent resource in drying food and what to look for in a good home dehydrator.